Our Amada HFP 130-30 press brake is a cnc controlled seven axis machine with a three metre wide beam and 130 tonne down stroking capacity. Programmes are produced off-line although the operator can make changes or write programmes using the touch screen menu system. The graphic screen leads the operator through each fold sequence with clear identification and orientation of the component for each fold. Equipped with the machine is a new suite of Amada punch and die tooling. 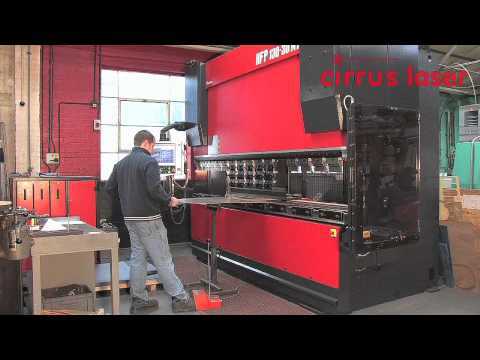 The press brake was specified to complement our laser and water jet cutting machines capacity. The machine has exceptional angular control from very thin (<1mm) to very thick (>8mm) with single V dies from 6mm to 125mm. View the tooling options available during a store Tour. To arrange this please contact Mike Martyn - DD - 01273 252 563.